Prepare (food, a dish, or a meal) by combining and heating the ingredients in various ways. A person who prepares and cooks food, esp. as a job or in a specified way. 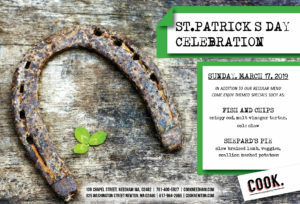 Celebrate St. Paddy’s Day with us on Sunday March 17th! Enjoy Irish specials including Fish and Chips with crispy cod, malt vinegar tartar and cole slaw, and Shepard’s Pie with slow braised lamb, veggies and scallion mashed potatoes. Reservations are recommended.